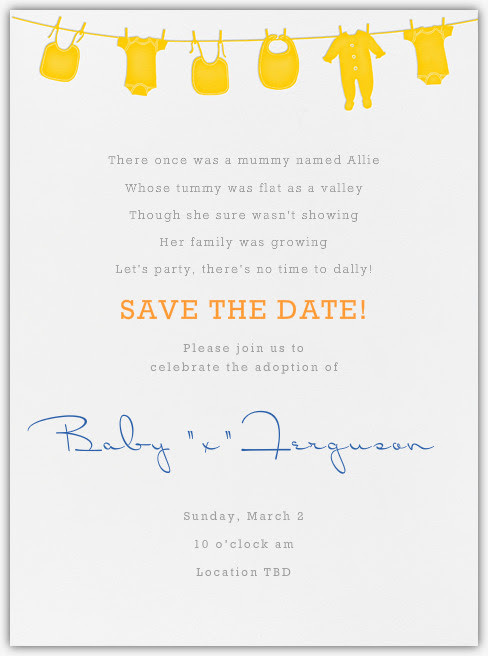 A Baby Shower for Charlie! 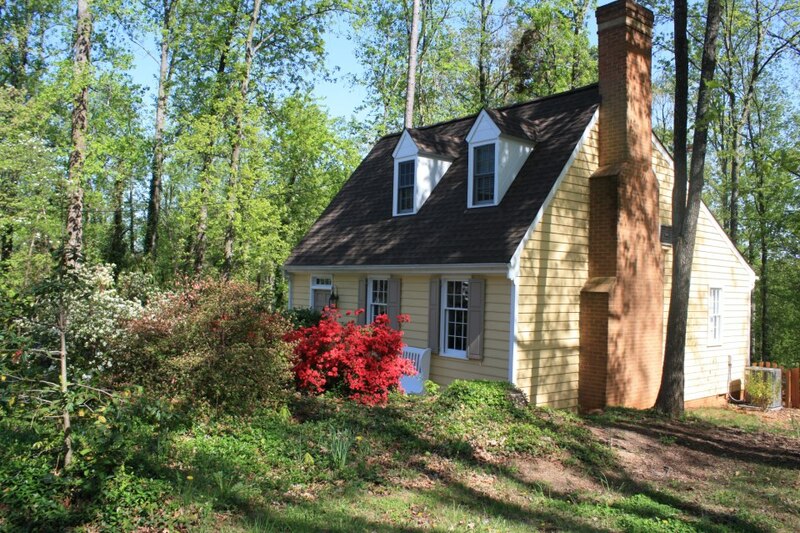 Some of you know that Jamie and I are relatively new to Charlottesville. We’ve been here for a little more than a year now, and are starting to settle in. Of all of the places we’ve moved to, Charlottesville has been the easiest place to make friends. People are so warm and welcoming here. I think the fact that it’s a small town helps. Everyone is just so nice. We have friends that we see on a fairly regular basis, we play on a co-ed softball team, and it feels like we’ve built a a nice little social circle. Because our friends here are all so new, we hadn’t yet shared the news that we are adopting with them. Partly because, well, there really isn’t any news to share yet. And also because it feels like we’re still in the “first trimester” of our adoption, if that makes any sense. Actually bringing our baby home still feels very far away and it seems like only the people closest to us should know in case something goes terribly wrong. It really means a lot to me, especially because my best friends, who would normally throw a shower for me, live on the other side of the country so I didn’t think I’d actually have one. And since we are adopting and everything is so different from an actual pregnancy, I wasn’t sure if a shower made sense, when to do it, etc. But as soon as I told her, my new friend was all about it and starting planning right away. It’s really sweet and I’m so thankful to have met such wonderful people here in Charlottesville. And thankful that we have a network of new friends that will be there for Charlie, too. There were many times when I wasn’t sure I’d ever have a baby, so the thought of having a baby shower is not something I ever allowed myself to think about. But now that I am having a baby–even though it isn’t happening in the usual way–I get to have a shower, too, just like any other mom-to-be. Because that’s what I am! Having a shower planned makes that feel very real. And that makes me smile. Thinking you have any kind of real control over your life is an illusion, I know. But it’s almost comical the degree of uncertainty we are experiencing right now. I know that I have no control over when we will be matched and where Charlie is coming from and when he/she will get here. So I can’t even pretend to know what’s in store for us the next six months. We could have a baby in three weeks. Or we could have one in seven months. We just don’t know. Never before have I been so aware of my utter lack of control. Planning? That’s for somebody else. My life will just happen when it happens. It’s really anybody’s guess at this point. Well, it’s official–we are halfway through the average six-month wait time to be matched. We’ve been presented to birthmothers for a full three months now. The time is actually flying by and this month I wasn’t sitting around, tapping my fingers, waiting for our update like I was last month. I was actually surprised to see it in my inbox. Here are the stats: we were presented to 11 birthmothers in December. (This number keeps going up so I guess our odds are getting better.) One or two of the women fell off the radar and three chose other couples. Six of the birthmothers we were presented to have not yet chosen adoptive families. So, I guess there’s still a possibility that one of those women will pick us. Who knows! 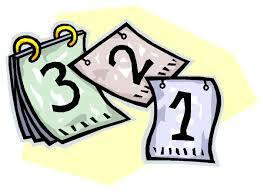 Our caseworker says birthmothers typically pick families within 7 – 10 days but some don’t choose until much later. Some even wait until they are about to deliver, or have delivered. Wouldn’t that be exciting! If we were tracking our adoption timeline as if it was a pregnancy, we would officially be through the first trimester now. Without a touch of morning sickness, I might add. We keep hoping for the call, but we have a lot going on right now and are content knowing that Charlie will find us when the time is right. I’ve been flexing my patience muscles a lot lately–good training for motherhood. Because I feel the need for something adorable today… here’s an unlikely pair sure to melt your heart. 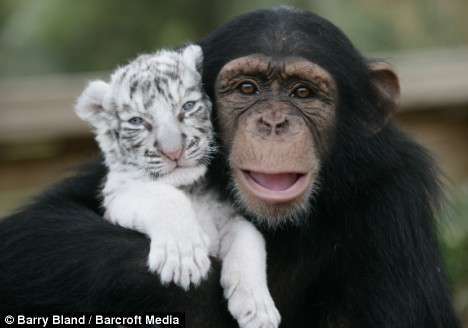 When this tiger cub had to be separated from its biological mother due to flooding after a hurricane, this chimp became his adoptive mother and began caring for him as if he was her own. How cute are these two? Animals adopt babies that need mothers, too, and sometimes even those of another species. This article has a few other adorable adoptive animal mothers and their “kids.” I know, I know – they’re just cute pics of animals, but it reminds me that adoption is a universal theme and not limited to mankind. When it comes to caring for an orphaned baby, love in the Animal Kingdom knows no boundaries. And that makes me smile. All children deserve loving mothers and fathers that have the time, compassion, desire, maturity, resources, and the will to care for them. Sadly, sometimes that is not the baby or child’s biological family. But that’s where adoptive families step in. I’m excited and proud to be a future one. If only I was as cute as this chimp! I try to avoid reading comments that people leave on online news articles–especially anything having to do with something as divisive as politics–because whenever I do, I become so disappointed in society. For reasons beyond my understanding, some people thrive on being mean and hateful. As sad as that was, the online comments I saw about the photo were far worse. I didn’t vote for Mitt Romney but who cares?! My political views don’t mean I get to mock his family or that I don’t think the photo of him holding his new grandchild, front and center, is absolutely beautiful. With a biological grandchild on one knee and his adopted grandchild on the other, Romey is saying that, in his eyes and the eyes of his family, both are equally his grandchildren. It’s a sweet photo and you can tell that baby is lucky to have been welcomed into such a seemingly warm and loving family (even if they’re wearing a bit too much plaid). He is surrounded by love. That love is what people should have commented on. But instead, people left racist, hateful comments that were difficult to read. 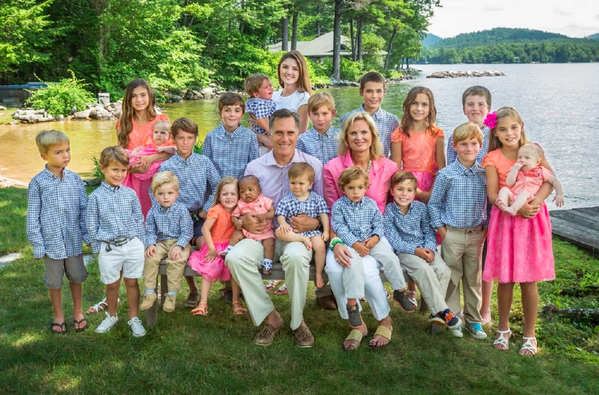 I can only imagine how the Romney family felt upon seeing them. It’s awful. I mean, what is wrong with people? We talk about bullying in our kids’ schools, but where do we think they learn it from?